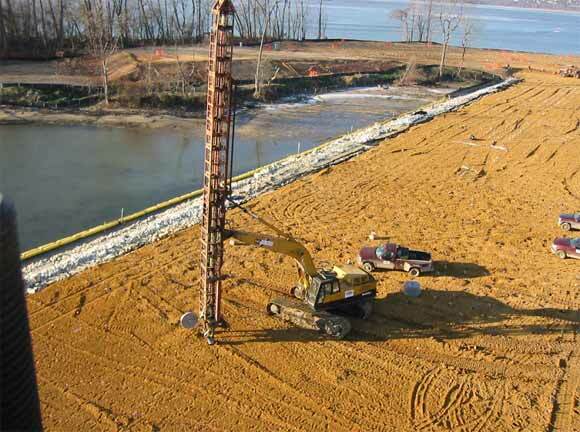 The approach embankments on the Maryland side of the new Woodrow Wilson Bridge crossing the Potomac River was underlain by up to 50 feet of soft river sediments. The design engineers’ calculations indicated in excess of three feet of settlement would result from the placement of new fill retained by MSE walls up to 35 feet in height. The design of the ground improvement program called for the installation of wick drains to maximum depths of 50 feet, along with high-strength geotextiles to support the new fill loads. intent of the wick drains was to accelerate the consolidation of the river sediments. A three-stage loading program was incorporated to allow the river sediments to gain sufficient shear strength to prevent a slope failure. TerraSystems installed approximately 800,000 linear feet of wick drains using two installation stitchers. Approximately one-third of the wick locations required predrilling due to stiff upper layers.